More than halfway through the season and the Canucks are still struggling to find a consistent offensive game. The Canucks talent pool has been reloaded the last two years with additions of Dane Fox, Brendan Gaunce, Bo Horvat, and Hunter Shinkaruk.Unless some scientist gives a time machine to forwards like David Booth or Zack Kassian the Canucks could be stuck in a hole for quite a while until those players come up. The short term improvement for this team is a trade, but the likelihood of that happening right now is slim to none. The Canucks who used to be a player or two from competing for the Stanley Cup but since have given up depth players like Maxim Lapierre, Manny Malhotra and Mason Raymond. The Canucks are more than a few players away from a cup contending team. It would be foolish of them to give up young talented prospects like Dane Fox or Hunter Shinkaruk for established NHL help. 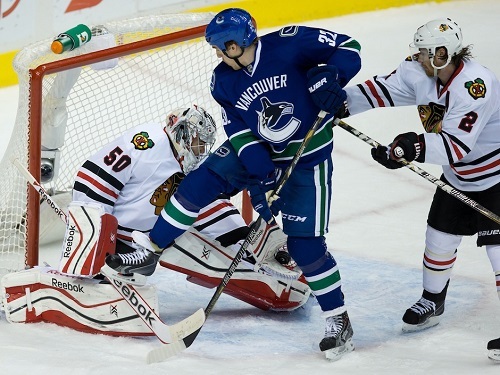 Dale Weise trying to score a rare goal for the Canucks against the hot Chicago Blackhawks earlier in the season. The time they should’ve made an impact trade was last spring that involved Alex Edler to the Detroit Red Wings which included Tomas Tatar and other assets, but the deal fell through eventually and Mike Gillis and his staff went back to square one. So they trade away Cory Schneider for the 9th overall pick in the 2013 draft who turned out to be Bo Horvat. They also swapped coaches with the New York Rangers and got fiery coach John Tortorella. The Canucks were left this season with the same group of scoreless forwards from last season and are having troubles generating offense. Henrik Sedin went goalless in 15 games before his rib injury, Daniel Sedin has no goals in 13 games, Kesler has one in 10 games and the list goes on. The Canucks impact forwards are doing nothing to score and don’t have any help. The problem with the Canucks is they need six or seven chances to score when they should only need one or two chances and that’s what’s hurting them each game. Just a few seasons ago the same core group of forwards had no problems scoring and was doing it at will, now it seems like it’s a daily struggle like me trying to get out of bed. Like former Canuck Todd Bertuzzi says: “It is what it is. You’re a smart guy, figure it out.” I know they’ll figure it out, but when? I don’t know. It could take a full team rebuild for the scoring problem to go away and if the Canucks go through a full rebuild, I know Canucks fans won’t enjoy it.